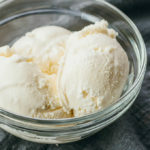 A fragrant vanilla ice cream recipe that's keto friendly, low carb, and sugar free. Just 4 ingredients and only 2g net carbs per serving. No ice cream maker needed. Prepare a durable pan with 1.5 quart capacity, safe for freezer and hand mixer use (I use a glass 9x5 inch loaf pan). Chill the pan in the freezer for about 10 minutes while you work on the next step. In a large bowl, combine all ingredients and whisk until the sweetener is completely dissolved. Remove the pan from the freezer. Pour the mixture into the chilled pan. Freeze for about 45 minutes or until the edges of the mixture begin to set. Scrape down the sides and use a hand mixer to beat for about 30 seconds on low or until smooth. Return the pan to the freezer. Repeat this process every 30 minutes to scrape down frozen bits and beat the mixture until smooth, freezing in-between, for about 3 hours or until the mixture is no longer liquid. As the mixture freezes, it will become firmer each time you beat it. After beating for the last time, use a rubber spatula to flatten the surface of the ice cream, cover, and store in the freezer until frozen. Prior to serving, take the ice cream out to let it thaw a bit before enjoying. This recipe yields 2 g net carbs per serving (1/2 cup ice cream).